Yellow Ombré! Sunny and Cheery! What people learn about me, is that I love to do just about anything, just dislike intensely having to re-do something. And that is what is happening here. Spent the better part of two hours writing the blog and yet, in a blink of an eye, it disappeared and I hadn’t saved it before publishing. Now I have to re-write it. Grrr. 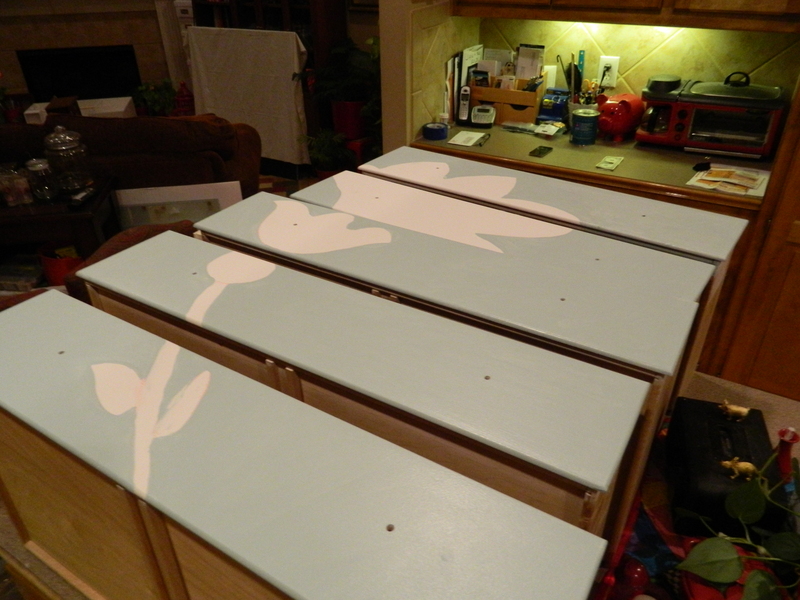 The first piece completed is this cute tall cabinet with five drawers. I finally broke out of the routine of the black/gray and pink ombrés and am very happy how this sunny yellow works on this piece. There is a very subtle shift in the shades to make it flow very nicely. I reduced the visual clutter on the front by only adding a single knob on the slim top drawer, as each drawer already has a built-in drawer pull. The next piece was a treasured find. The first edit of this post had a well thought out discussion around the finding of this piece and perhaps, at another time I will feel the urge to come back and regurgitate those thoughts again. 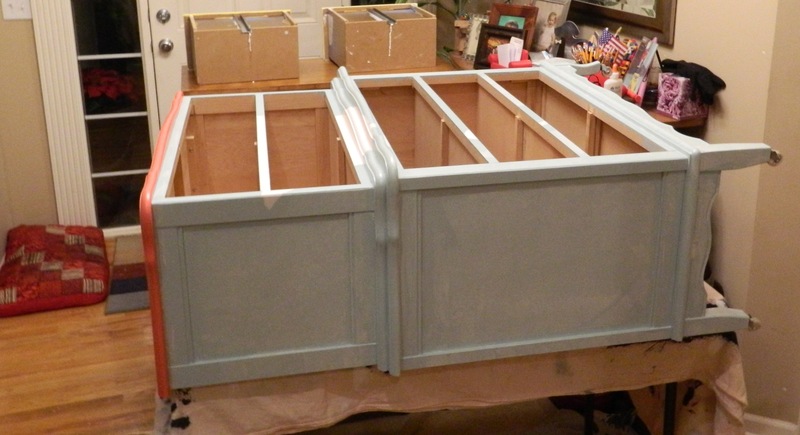 A quick update on the special project: The cabinet and the drawers have gotten their first coats of ‘Watery’ blue. This is a different brand of paint, provided by the client, and thus far, am not overly happy with it. The Behr premium paint that I have been buying comes with a built in primer and makes it thicker and gives a more rich color in less coats. I fear that the result of the first coat is going to require more than I normally have to apply. In order to acheive the rich ‘Begonia’ pink on the top, it took no less than 4 coats. 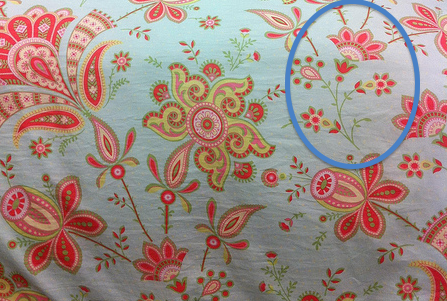 I pulled this flower shape directly from the sheets that are being used on the bedding in the room. Can you see it? I still have to purchase and paint the flower, right now it is absent any color (what you see if the primer). 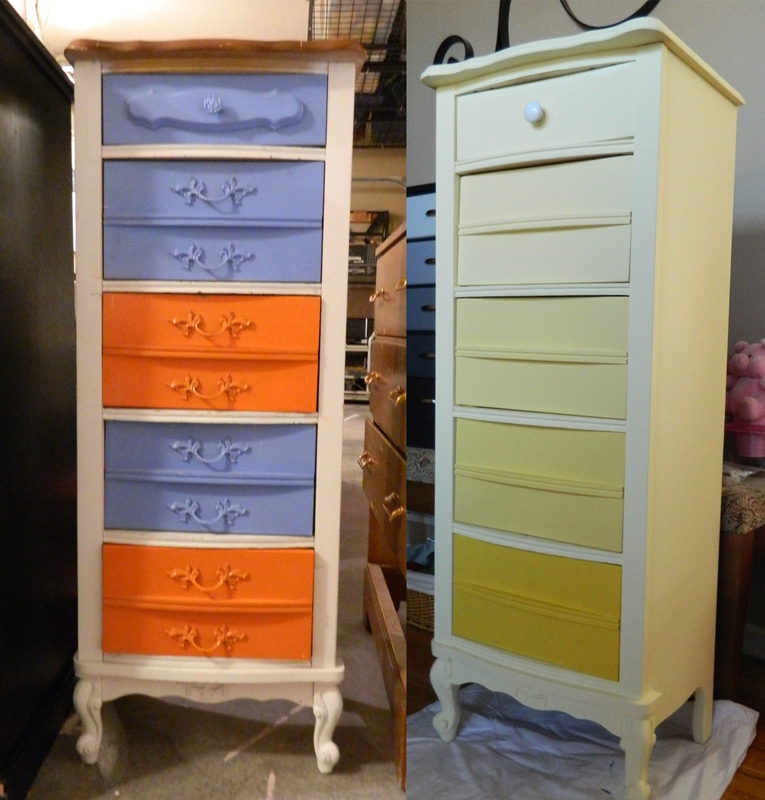 I want it to have the same full painted feature as the rest of the dresser. I went on endlessly about more things, but right now I am not in the mood to try and recall all of it. Frustrated by the disappearance of more than a thousand words and a few more photos has me being brief. Thanks for dropping by! And as always, Happy Crafting Y’all! 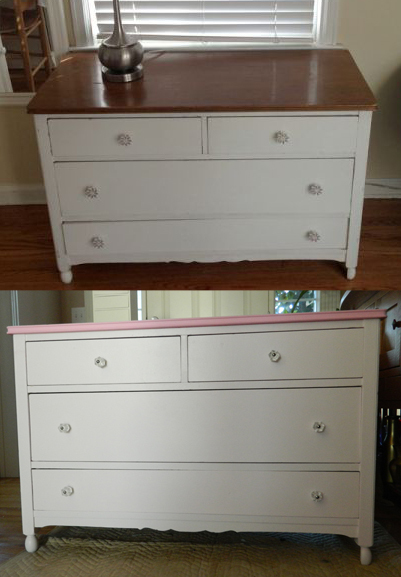 I have two dressers exactly like the one you did in ombre yellow. I love the clean look without the extra hardware on the front. Do you find it more difficult to grip and pull the built in drawer pulls. I have been wanting to do a project with them, i just haven’t figured out what yet. On this particular piece, the grips were sufficient. I think it depends on two things: one, who will use it and how well they will be able to use it. Also, with the grips being outward, it seemed to me that adding knobs or pulls would be too much, you know? I liked the clean and simple look of going without. I would love to see what you decide to do with your pieces! And thanks for dropping by!